The Westport resident could not understand how America had chosen such a man as its leader. “I’m a very positive person,” Klein says. “But I became very negative.” She vowed to do something to change her state of mind. The New York City native had spent 17 years at McKinsey; now she was global event manager. In April 2014 she, her husband Fred and young son Carter had moved to Westport from the city, for the schools and amenities. In the past, Klein had volunteered for presidential campaigns. But she had never — not in New York, or her new hometown — been involved in local politics. She quit her high-powered job. 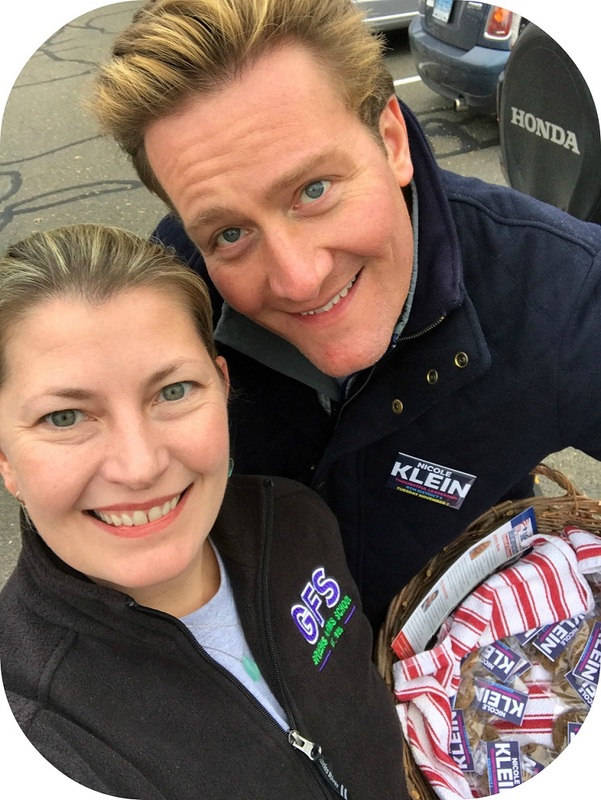 In March, Klein became deputy registrar of voters. Working in Town Hall, she learned the ins and outs of Westport government. The Representative Town Meeting intrigued her. When 2 members of her Greens Farms district decided not to run for re-election — and Klein realized there were no “moms,” or even any females — representing District 5, she threw her hat in the ring. She knew nothing about campaigning. Friends offered advice: Go to the train station. Go to the transfer station. Make signs. It was a very competitive race. In 8 of Westport’s 9 districts, 4 or 5 candidates vied for 4 seats. District 5 had 8. The 1st-time candidate faced hurdles. A random draw placed her name at the bottom of the ballot. Because election season is the busiest time of year for the registrars’ staff, she could not campaign for herself on that crucial Election Day. Fortunately, an “amazing team” — including her husband and son — stepped in. Carter Klein scrupulously obeys the electioneering law. Oh, yeah: Just a few days before the election, the Kleins moved from their rented condo into a new home. “There was a lot going on,” Klein says understatedly. With over 1,900 voters to reach, she focused on the population she felt she could best impact: the school community. “I hoped people were excited about a mom running,” she says. They were. Klein earned the 2nd highest number of votes in District 5. It took a while before she learned the news, though. She was so busy at Town Hall, she could not immediately check the text her husband sent from the Greens Farms Elementary School polling place, with the results. As an unknown quantity in a heavily contested race, lacking name recognition, Klein had steeled her son for the possibility of defeat. During the campaign, Klein surprised herself by realizing how much she wanted to win. The closer Election Day loomed, the more she hoped she could serve. Now she looks forward to learning even more about how Westport works — and about how to help her district. She has heard constituents’ concerns about high-speed trains coming through the Greens Farms station, maintaining the stellar school system, and the financial stability of the town. She is not afraid to asks questions, and learn more. The other day, a League of Women Voters member asked Klein to serve coffee at tonight’s swearing-in ceremony for Westport elected officials (7:30 p.m., Town Hall). Klein had to say no. She’ll be busy taking the oath of office herself. 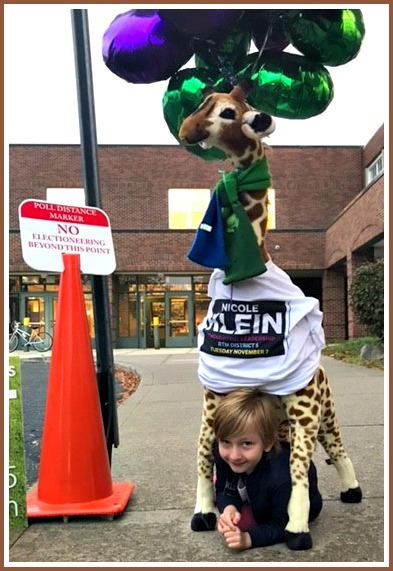 This entry was posted in Local politics, People, Politics and tagged Nicole Klein, Westport RTM. Bookmark the permalink. Welcome to the RTM Nicole! Nicole will be a great addition to the RTM! I sometimes wonder how much longer the ruse that the Westport RTM is non-partisan will be maintained. Your assertion that the RTM is partisan is FALSE. There are 14 new members and no one knows their party affiliation nor does anyone care. Name one issue and one outcome where party politics played a role in a RTM vote. Members of the RTM have a Code of Ethics and sign a Conflict of Interest Statement. Your claim is nonsense. Lou, although I don’t think you’d really want me to start naming names here I don’t know what you’re so worried about. As I said, almost nobody cares about the partisanship that everyone in both parties knows has infected the RTM. Thanks, but I’d be happier if you’d stop talking trash about me all over town. It’s been over 10 years now and it’s getting kinda creepy. If you have something to say just talk to me. I won’t bite. Wonderful story about Nicole, and getting involved locally. Very thankful for people like her who step up, run for office, and then serve (!) I hope her story inspires others to do likewise; you can make a difference, especially locally. I am looking forward to working with you, Nicole! Thanks to you, Dan, I met Nicole and her son, Carter, at this year’s 06880 party — we shared glitter tattoos! Just last weekend I did a glitter tattoo party for her son’s birthday and also met her husband, Fred. I can totally see how she received the second highest number of votes out of the 8 candidates and am sure she’ll do a great job for her district. What a lovely family! So happy to have you as one of our representatives! Thank you for your service to our wonderful town! Notwithstanding the fact that a political appointee (Democrat party appointed Deputy Registrar) is about to join the ostensibly non-partisan RTM, a town employee serving on the RTM presents, in my view, a conflict of interest that’s impossible to remedy. Some years ago, a Staples High School teacher — a town employee living in Westport — served on the RTM. I recall that when a question was raised about the propriety of that, the town attorney ruled that it was entirely legal. A town employee serving on the RTM, is a conflict of interest for all the reasons one might imagine. That doesn’t make illegal. Just unfortunate. As for the optics of a political appointee serving on the RTM, it’s a poorly kept secret that partisanship has seeped in RTM already. I can’t even believe anyone, at this point, still bothers to keep up the non-partisan cover story. In any event, almost nobody (except residents when you ask them) cares about this issue so I suppose it’s all moot. The RTM is non-partisan because candidates run without party affiliation and support. I’m sure that most, if not all, are registered with one of the “four” parties. (I have four in quotation marks because two are minor parties devoted to P&Z issues.) To carry your statement to its logical conclusion, Morley, would require that all RTM members be Unaffiliated voters. Nope, just not appointed by a political party or elected officers associated with a political party. No big deal. Except that evidently it is. No Municipal appointments should be politically labeled. Period. It is impossible not to have a real conflict of interest. Impossible. At best we can hope she recuses herself if any vote occurs that would raise a conflict of interest. Knowing Nicole, I am sure she will recuse herself for any vote with the slightest conflict of interest. But since you bring up the fact that the Connecticut House leader is also a union leader: What about the fact that the President of the United States is also a real estate developer with a Washington hotel whose landlord is the US government? Perhaps he has one or two other conflicts of interest too — who knows?! Dan-Two wrongs do not make it right. I wish Trump would go away as I do Leader Joe (Speaker of the House in CT). Both have hurt their respective constituents. Maybe people in Westport do not know but Governor Malloy just cut funding to Westport by approximately $215,000. Just happened. In addition, it was just announced that CT is running a $200,000,000 budget deficit, just a few weeks after the announcement of a bipartisan BALANCED BUDGET. The question now, will taxes go up?? If I was a senior citizen in CT I would be very worried. We live in difficult times in both CT and the US. As you know I focus a lot of attention in CT’s fiscal crisis and it is getting worse. Much worse. Not only am I so impressed and inspired by Nicole’s story, but I’m humbled to call her a friend – one with whom I’ve only recently connected through this year’s election cycle. 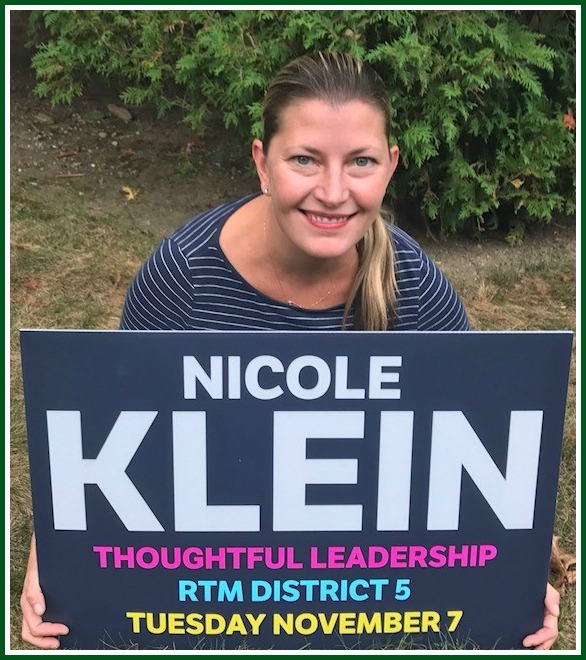 I have no doubt the passion and dedication Nicole has shown as a person and candidate this year will carry over to a wonderfully successful tenure on the RTM. We are so lucky to have her serving our community!